The elevated position of St James church in the centre of Cardington on what is believed to be an ancient henge monument gives it an impressive setting nestled among the surrounding hills with its tall crenellated tower visible from all approaches. 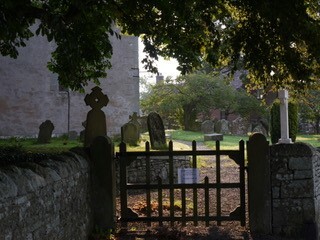 The circular churchyard has five wooden gates, significant in St James’ pastoral role, including the south gate for funerals and the wedding gate by the war memorial. 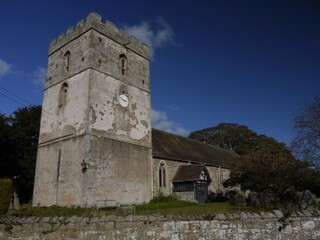 The Doomsday Book in 1086 records the village as ‘Cardintune' but it is not known if there was a church before the present structure was begun in the twelfth century using coursed rubble stone. 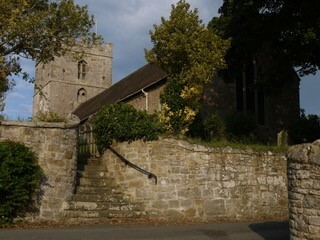 The tower, nave and chancel are of Norman, Early English and Gothic architecture and the church is now Grade 1 listed. The eastern part of the nave probably originates from the second half of the 12th century, extended later with new north and south doorways. The north doorway, now blocked, has a tympanum, which may have been recycled and reversed, noticeable from outside. A longer chancel was added in the 13th century. It has a restored triple lancet window in the east wall and two windows in each sidewall. An aumbry or 'cupboard' is set deeply in the north wall near the Priest's Door for keeping the sacrament and oil. On the opposite wall is a double cinque-foiled piscina for washing the chalice and the priest’s hands, discovered during restoration work to the tomb of Judge Leighton who died in 1607. His effigy nearby always supports a leek at Harvest Festival. Three two light windows were added to the nave in the 14th century and the tower gained an upper stage and battlements in the 15th or early 16th centuries. The chancel roof has tie and collar beams with quatrefoils between the purlins like the nave roof which has braces instead of quatrefoils. 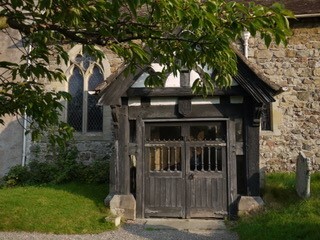 The porch has its construction date, 1639 and various initials carved on a small wooden shield above the gates. The lower sidewalls are of stone and the upper part of wooden spindles, protected now by glass and the notice board. The great door has the date 1648 carved with the initials RC, Richard Corfield, as well as WB and CW. Another window was inserted in the south wall of the nave in 1703 and in 1741-2 a gallery was built at the west end. This was later removed, perhaps in 1867-8 when restoration work was done and a screen between the nave and the chancel was dismantled. A Norman tub font with arcaded decoration was replaced by the present one in 1868 as a memorial to the Rev. William Jones Hughes, the vicar for forty years, who died in 1865. The Jacobean pulpit is curiously decorated with five carved panels showing what are said to be mermen but may depict symbolical fishermen. The reading pew was replaced in 1910 with a lectern in the traditional eagle form. A finely carved panel of the crucifixion in the front of the altar came originally from the pulpit. The Elizabethan pews have been restored, many bearing carved initials from the congregation. A wooden reredos was placed behind the altar in 1897, obscuring part of the beautiful Early English window but the wall behind the altar is covered with brightly coloured glazed tiles with the words "DO THIS IN REMEMBRANCE OF ME” adorned with grapes and ears of wheat. Two saints keep watch on either side. Below this, resting on the altar, is a long piece of timber carved with "HOLY HOLY HOLY" and the Crown of Thorns with three nails and a hammer. These embellishments, with the decorative tiles on the floor, are probably part of the restoration in the late nineteenth century. But the tiles in the nave are much older and four in the floor by the font are decorated in the encaustic manner of medieval times showing a leaf much like that of Ranunculus Repens — the creeping buttercup. The tiles were carved and different coloured clay pressed into the design before being fired. Cardington’s bell tower is interesting, with a medieval timber "A" frame thought likely to be the oldest in England. Originally there were beds for three bells on this frame rung from the vestry floor. In 1553 there were three bells, in 1740 four and by 1752 five. It seems that in 1887 the old treble, and third (originally cast in 1740 and 1630 respectively), were recast to make a ring of four. There is no further mention of a fifth bell. In 1981 the old ring of four was completely restored by Taylors of Loughborough, and installed in the clock room in an iron frame with new fittings. The new frame was installed beneath the old timber frame, retained because of its antiquity. In 1985 a new ringing gallery incorporating the organ platform was built in the vestry space and the new pipe organ was installed that November. On 2nd September 1985 a stone, let into the jamb of the west window and engraved with a set of old belfry rules dated 14th February 1755, was removed by the Tower Captain and re-positioned in the ringing chamber where it can be seen and read more easily. In 1990 Taylors cast two new trebles making a ring of six. They were dedicated on All Saints Day 1st November 1990. Then in 2005, thanks to a generous legacy from long-standing resident and former bell ringer Kath Cooke, a further two trebles were added, again by Taylors, completing the ring of eight. The church was dedicated to St. James the Great before 1542. He is often represented as a pilgrim with the emblem of the scallop, the 'Coquille St-Jacques' but he is also shown with a sword and is one of the watching saints on the right of the altar next to St. Peter who holds the keys. On the other side St. Andrew and St. John are shown holding books. The church celebrates St. James' Feast Day on 25th July.